This summer we got our home insulation improved. I've been anxious to find out how much this is going to save us on our energy bills. When we got the October bill it seemed we where saving up to 50% on our heat costs. But that was just one month and I had low confidence in that estimate so I want to watch the electric usage through the winter to get a better idea of what the savings are. The other day I checked the electric meter on our house to see how much energy we'd used so far in November. 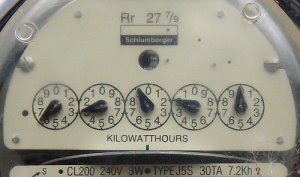 The reading was 1982 kW. When we got the October electric bill the reading was at 1331 kW. So for the first 12 days of Nov. we had used 651 kW. That comes out to about 54.25 kW per day. Last year in November 2008 we used 66 kW / day average over the month. So thus far in Nov. 2009 we've used about 12 kW less per day. Our average basic electric usage is about 24 kW. So in Nov. 2009 we're using about 30 kW /day for heat and in Nov. 2008 we used about 42 kW /day for heat. That is about a 28% decrease in electricity use for heat so far in November compared to last year. Of course temperature or our electric usage could change the bills. But I don't think either of those are significantly different this year compared to last year. Looking at the average temperatures in Nov. so far this year we're a little bit colder than the average temperatures in Nov. for 2008. So if anything this year is a little colder and so our heat bill should be even higher this year compared to last. As far as I can see our electric usage has been not changed. So in other words we haven't raised or lowered the temperature and our other electricity usage is the same pattern as last year. I'll continue to watch the usage and look at each monthly bill then see how it compares to last years use. Hopefully this trend of saving 25-50% level continues through the winter.